As the pirates of the Golden Age became more fierce and defiant, European countries were at a loss for how to deal with what was becoming a plague on commerce. English pirates, Blackbeard included, no longer avoided merchants of their own nationality, and many turned on trade to and from the British colonies in retribution for the executions of fellow pirates. In response, on September 5, 1717, King George I of Great Britain issued the “Proclamation for Suppressing of Pirates,” granting full pardon of all crimes to pirates who surrendered themselves to any governor in the colonies within the next year. On or after September 6, 1718, any pirate who neglected or refused to surrender was fair game for capture and trial. The proclamation offered a reward of 20 to 100 pounds for the capture or assistance in the capture of any pirate after that date, depending on the pirate’s rank among his or her crew. As an added incentive, pirates themselves were offered 200 pounds to turn in their captains, over $40,000 in today’s money! This wasn’t the first time England tried dealing with pirates by granting clemency. James II granted a pardon in 1687 to all pirates who surrendered to his appointed naval officers within a year of his proclamation. He also stated that any who refused to surrender “shall be pursued with the utmost Severity, and with the greatest Rigour that may be, until they and every of them be utterly Suppressed and Destroyed,” and that they would never again be granted mercy. The Golden Age shows us his attempts weren’t as successful as he hoped. King George I reissued his proclamation to the West Indies in December of 1718, this one known more widely as the “King’s Pardon,” extending the surrender deadline to July 1, 1719 because he believed some pirates did not have enough notice to surrender by September 1718. He offered the same pardons for pirates and rewards for captors, but the incentives were too good to pass up for the growing numbers of pirate hunters roaming the seas, resulting in many pirates being unable to avoid the noose. -King George I of Great Britain. “1717, September 5. A Proclamation for Suppressing of Pirates,” in British royal proclamations relating to America, 1603-1783, edited by Great Britain Sovereigns and Clarence Saunders Brigham, 176-177. New York: B. Franklin, 1911. -King George I of Great Britain. “1718, December 21. A Proclamation,” in British royal proclamations relating to America, 1603-1783, edited by Great Britain Sovereigns and Clarence Saunders Brigham, 178-180. New York: B. Franklin, 1911. -King James II of England. “A proclamation for the more effectual reducing and suppressing of pirates and privateers in America.” London: Charles Bill, Henry Hills, and Thomas Newcomb, 1688. Accessed August 20, 2017, https://lccn.loc.gov/2006700059. 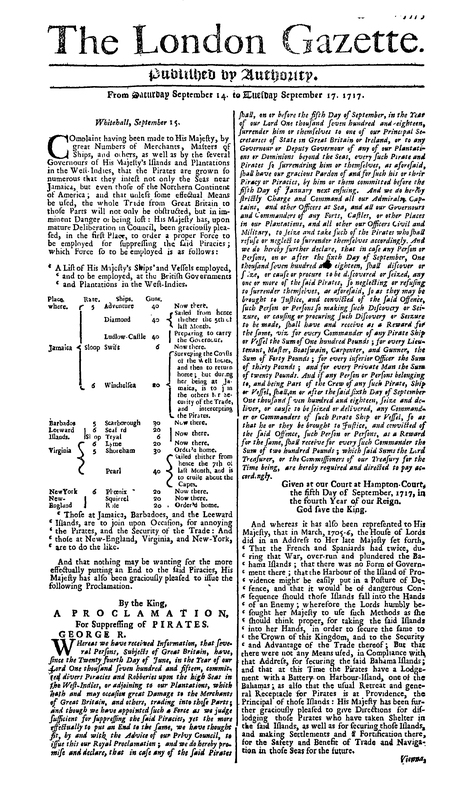 -The London Gazette, From Saturday September 14 to Tuesday September 17, 1717, available under the Open Government License v3.0.